Mill-Max now offers a series of rugged spring pins capable of carrying 9 amps continuous current at a low 10° C temperature rise. The Mill-Max high current spring pins are the perfect solution for rugged applications and for use in circuits operating at currents above signal level. The 08XX series is characterized by a greater mass and surface area which provides a lower resistance electrical path than miniature spring pins. Because they are designed and built with the same precision of our miniature spring pins they exhibit excellent signal integrity in shock and vibration environments. 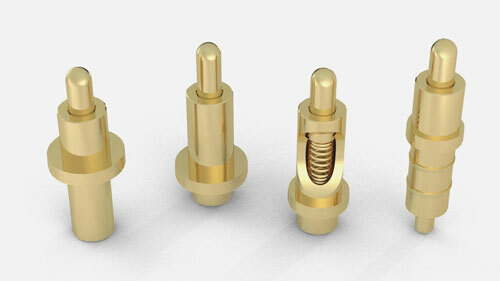 These large scale spring pins feature a gold plated stainless steel spring, a larger, up to .092" (2,29 mm) diameter solid plunger and thick wall construction to withstand the rigors of demanding applications. The generous, up to .090" (2,28 mm) maximum stroke is excellent for applications where stack up tolerances are great. Applications include board stacking, docking stations, cable assemblies, quick connects and anywhere there is a blind mate situation. Rated at 100,000 to 1,000,000 cycles minimum, the Mill-Max 08XX series spring pins are the best choice for higher-current, high reliability spring pin requirements.